I recently tried the new IHOP Cinna-Stacks pancakes and I thought I would take a moment to give you my review. I hope you like it! I don't like it... I love it! Thanks so much for sending the review. You've inspired me to try to get to IHOP this week. I'll put it on MrBreakfast.com so other people can read your review. Hey wait... it's already here... on this page. Isn't the internet amazing. Great review Heather! Thanks again. Pancakes and cinnamon rolls... these tasty breakfast dishes have delighted breakfast-eaters for years. What could be better than enjoying one of these delicious treats, you ask? Combining them, of course! Now I know what you're thinking: Pancakes + cinnamon rolls = feeling sort of sick and taking a trip to the dentist. However, that is not the case with IHOP's new Cinna-Stack Pancakes. Granted, they're not really a combination of pancakes and cinnamon rolls, but all the flavors are there. You've got hot and fluffy flapjacks, rich cinnamon roll filling, drizzles of luscious cream cheese icing, a dusting of cinnamon sugar, and a dollop of whipped cream all piled into one amazing experience. This may seem like sugar-overload, and well, I'm not going to sugar-coat it (as if they need any more sweetness): It is a very rich meal. 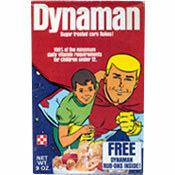 Nevertheless, I have to say that these are quite possibly one of my favorite breakfast foods of all time. I have had IHOP's latest creation a total of 5 times over the past month and something about them keeps me coming back. After taste-testing these a few times, however, I noticed that the cold whipped cream kind of takes away from the overall taste of the pancakes. I've found that it kind of runs together with the icing and messes up the creamy flavor, so now I simply ask my waiter or waitress to hold that particular topping. Unfortunately, they are advertising these pancakes as a limited time offer, which means us Cinna-Stacks lovers will probably start experiencing withdrawals in a few weeks. Hurry in to IHOP and get them while they last! Price information unavailable; listed as $0.00. 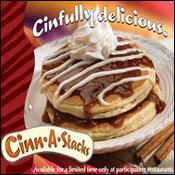 What do you think of Cinn-A-Stack Pancakes? I loved the Cinn-A-Stack Pancakes. It's been a couple of years since I had them. Do they still have them on the menu? LOVE those pancakes! So delicious and yummy in my tummy. I could eat them anytime, anywhere. Favorite breakfast yet. I give them infinity out of 5. May sound like I'm over my head, but just try it, you'll see. It is smaller then u think but tastes very good. No need for syrup its already sweet. Whoever is hating and is just going to sit here and call people fat can leave and not come in this forum in the first place You must be really insecure if your going to sit here complaining about "Fat" people. Get a life. These were very tasty!!! And to guy from England, you guys are ranked 3rd for obesity rates anyways so I don't think you guys are in any position to judge. I'm sure you guys have cinnastacks being prepared somewhere in your country so don't knock on it, until you tried it. At least we can properly use exclamation points, Guy. At least we know it's very silly for some English guy to refer to himself as a Guy. And at least our breakfast is tasty! I had the cinn-a-stack french toast this week... yumm! What on earth!!! And you wonder why you lot are so huge!!! !